Many people will agree that violence against women, in any form, is wrong. What people often don’t realise is that the cycle of violence can start with attitudes and beliefs that boys and girls develop as children. 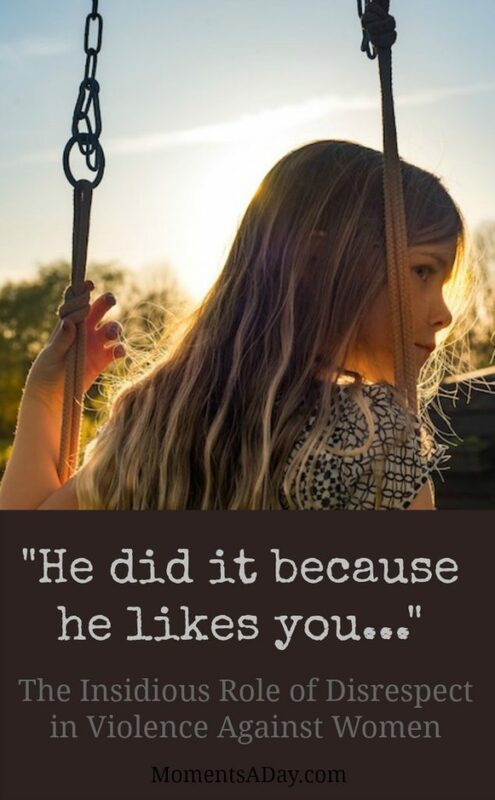 Saying things like, “Boys will be boys” or “He did it because he likes you” create and reinforce harmful patterns in our society. As adults ignore or downplay disrespectful behaviour, they are teaching kids that aggression is just being part of a boy or that girls play a role that makes them “deserve” it. 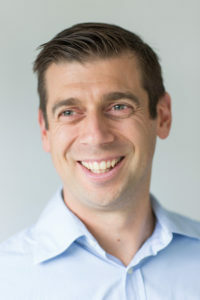 Today I’m sharing an interview with parenting educator Dr Justin Coulson on this issue. Dr Coulson is a father of six daughters, is the author of 21 Days to a Happier Family and has a PhD in psychology. You may have seen him writing the parenting advice column for Sydney’s Daily Telegraph or as the parenting expert on Kidspot. Can you give us a little background into the purpose of the Respect campaign? Domestic and family violence are increasingly being recognised as a problem in our communities, and awareness is increasing – which is great. We still have a long way to go, but we’re on a positive trajectory. But what is poorly understood is the hidden signals and messages that appear in our words and conversations around gender and respect, and expectations for what is appropriate or inappropriate behaviour for girls and boys. 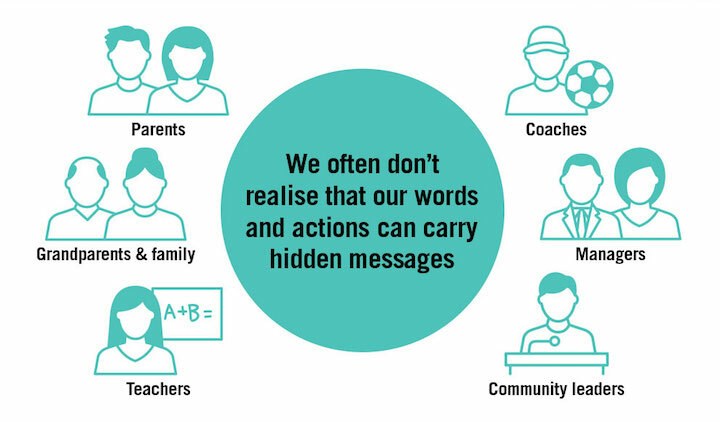 This campaign asks us, as parents, to pause and ask ourselves whether the things we say to our kids (or the things that teachers, or coaches or community leaders say) could be influencing the way they see relationships work. 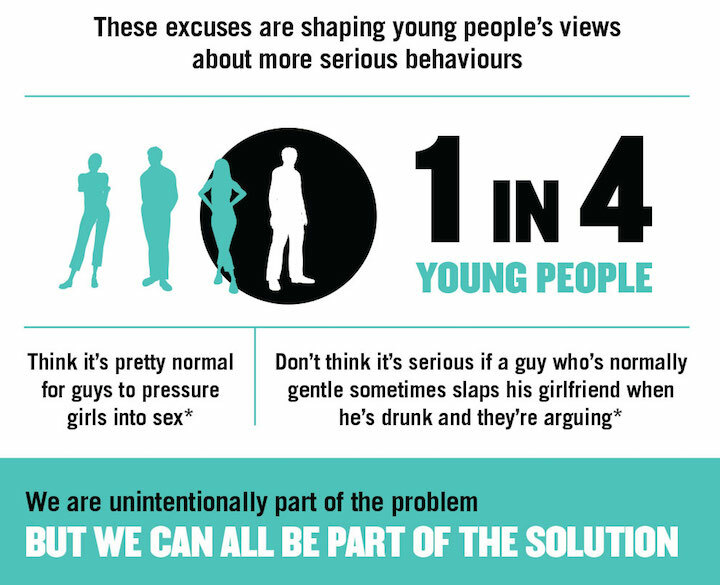 For example, if a boy is aggressive towards a girl and our first question is “well what did she do?”, or if we scoff and say, “it takes two to tango” we are sending boys a message that their aggressive behaviour is justified, and telling girls that they are at fault for his behaviour. We often shift responsibility from an aggressor to a victim (called ‘victim-blaming’), or play down disrespect towards others (where we laugh along and say, “it was just a joke… lighten up.”), or we argue that boys are just naturally aggressive. This campaign asks us to consider these messages we send, and shift our language so we’re looking at ourselves first – and setting a good example for our kids. Why is paying attention to disrespect so important? What age do kids learn beliefs and patterns of behaviour about women? There’s no “age” or magical number. Rather, the socialisation process is ongoing. It starts from the day our children begin to make sense of their world as infants, and continues throughout adulthood. We are always absorbing environmental standards of behaviour and being influenced by them one way or the other. Those influences impact on our beliefs, and ultimately lead to changes in our behaviour. 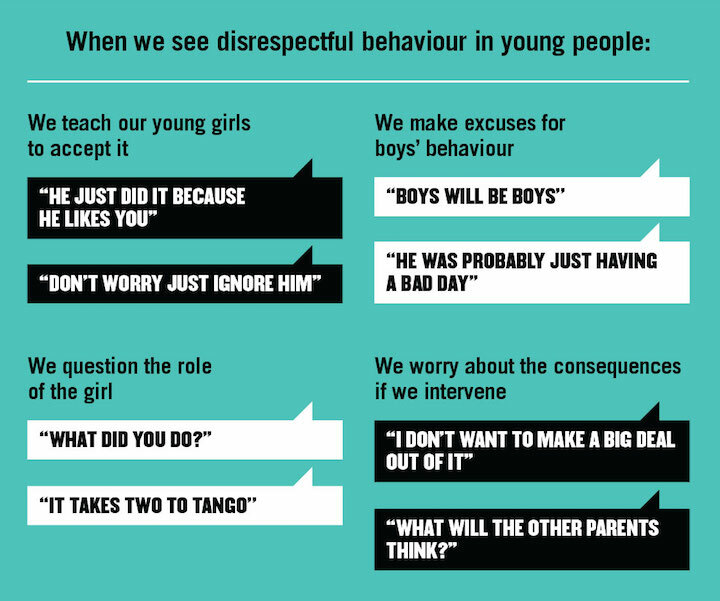 We want our children to internalise healthy beliefs about respect, and about men and women. But too many prevailing attitudes are unhelpful and even unhealthy. By changing the message, we shift the belief, and ultimately affect the behaviour. What are some examples of “disrespect” common in today’s society? The basic stuff is back-chatting, name-calling and insults – especially when it comes to gender – pot-stirring, or refusing to listen or respond to people as, well… people. That can escalate to bullying, baiting, spreading rumours, threats and even being physical. Family members, teachers and sport coaches are influencers of children and thus have the opportunity to promote respect and call out disrespect when they see it. If you hear your child engage in name-calling or disrespectful behaviour, it’s important to speak with them about why it’s inappropriate. This is a good opportunity to teach your child clear boundaries about what is respectful behaviour. There are some useful tools on how to start that conversation on the www.respect.gov.au website. How should kids stand up to people they know when they see women being abused? If you, or someone you know, is in immediate danger, call 000. For 24/7 counselling and support for domestic and family violence or sexual assault call 1800RESPECT on 1800 737 732 or go to www.1800RESPECT.org.au. Children can speak with someone they feel safe with such as another family member, their teacher or a medical professional. Children can also contact the Kids Helpline on 1800 55 1800. It’s a free, private and confidential, 24/7 phone counselling service specifically for young people aged between 5 and 25. Children should never be expected to physically intervene in any scenario of violence, especially family violence. this animation provides facts and dispel myths on the issue. I couldn’t agree more with this post. Such an important issue to address. We can making simple changes to our choices of words and make a big difference.